I always imagined that if I had a little girl someday, we would dress up as The Flintstones for Halloween. I enjoyed the show tremendously as a kiddo, and aren’t nostalgic Halloween costumes always the best? Whipping up the costumes was actually easier than I thought it would be. Sure, you can find Fred and Wilma Fintstone costumes online and in stores, but I wanted to save some money by putting them together myself. 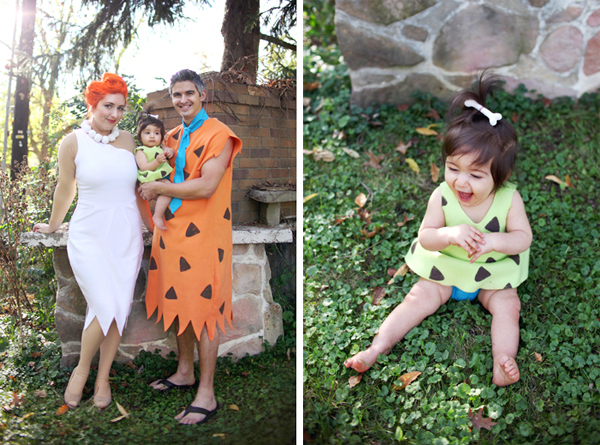 You can check out my Flintstones Family DIY Costumes post I did at Babble for more instructions. But the trickiest part is probably creating Wilma’s cartoon hair. This Wilma Flintstone hairstyle took around 15 minutes to put together, and used two cans of extremely toxic orange hairspray. Yuck! But it wasn’t as difficult as I thought! If you follow me on Instagram, you may have already gotten a peek at my Wilma-do. But here’s the full tutorial for how you can do it yourself. First I pulled aside a section of hair at the top front of my head and pinned it to keep it out of the way. Then I teased the rest of my hair with some hairspray and a bristle brush, focusing on the area on the top of the sides, where Wilma’s hair protrudes in the cartoon. Next I pulled my hair up in a ponytail holder at the top of my head. At this point I pulled some of the hair on the sides of my head out a little to accentuate the pointy cartoon look. 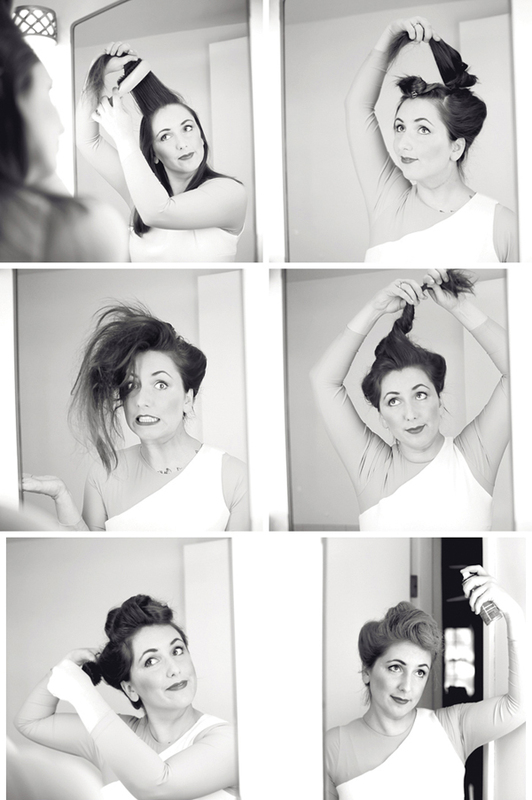 To create the bun, I used hairspray and a bristle brush and teased the hair that was in the ponytail. This created the body of the bun, so all I had to do was wrap the extra hair around the bun and pin it into place. All that was left was the front portion. I pulled down the reserved hair at the front of my head and really went to town with teasing it into a big mass. This took a lot of hairspray and a bit of work with a bristle brush. Next, I smoothed it a little bit with the brush and began twisting it upward for the pompadour twist. I kept this hair loose, so I wouldn’t loose the body, and spiraled the twist inside of itself, pinning it into place with lots of bobby pins. Then I sprayed it with a coat of hairspray and smoothed it with the hairbrush. The last step is covering the style with orange hairspray, which can be found in a costume shop or online here. Beware, guys, because this stuff is really toxic! I may have photographed myself in the bathroom, but in actuality I sprayed this outside and I probably should’ve used a breathing mask even still. You will want to cover yourself with a drop cloth of sorts, also, to avoid overspray getting on your clothing. While spraying, keep your sprays even and light. Then when you’ve finished, the overspray on your skin easily wipes off with a slightly damp cloth. Check out the rest of our family’s costumes here at Babble! Lucy makes a pretty cute Pebbles, eh? Your Wilma costume is looking great- you might have to figure out a way to turn that dress into everyday wear, because you are seriously rockin’ it. OMG you look adorable, all of you. Lucy is such a happy little girl! The talent that oozes out of you is crazy amazing! LOVE this, Mandi! This is awesome! Lucy looks adorable!!! This is unbelievably adorable and well done. Your costumes are phenomenal. Lucy is going to have such great photos to look through when she’s older. Your costumes are absolutly FABULOUS!!!! That’s so wild, I love it! Great tutorials Mandi :) And I didn’t know Lucy could get cuter– but she did it again!! Again, LOVE LOVE LOVE your costumes and think this was wonderful!!!! aww. Ok so I just caught up on all your posts…The pumkin farm LOVE…so miss my kiddo’s being little and taking them to ALL that fun stuff. AND your right there eyes are magical. 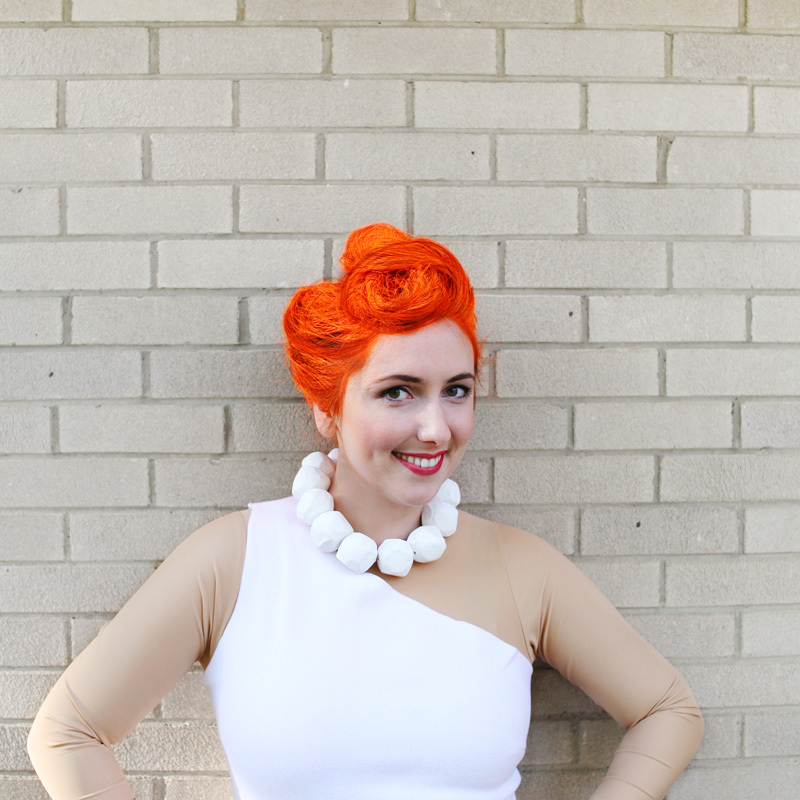 The Wilma Flinstone hair is awesome…OMG one of my favorite all time cartoons. You just tickle me pink. From one mid~westerner to another. Happy Fall!!!!!!!!!!!!!! OH and I am so glad your feeling well, SO happy for that!!! Costume is awesome Where did you get the orange hairspray? Love this tutorial for the costumes and the hair! I used it to make our costumes this year although I had already made pebbles prior to seeing this tutorial. Can’t wait to try out the hair tutorial in a few hours for a Halloween party tonight ?